setting a 6 year record. Well, months of low contract activity have finally caught up with the Chicago real estate market. We had been dodging this day of reckoning for a while by drawing down the backlog of pending home sales but that debt eventually had to be paid back and apparently September was the month for that. Home sales declined by a whopping 15.0% from last year, which is the biggest decline in more than 7 years. When the Illinois Association of Realtors reports their numbers in 2 weeks they will show it as a 16.6% decline because of a flaw in the way they do their comparisons. 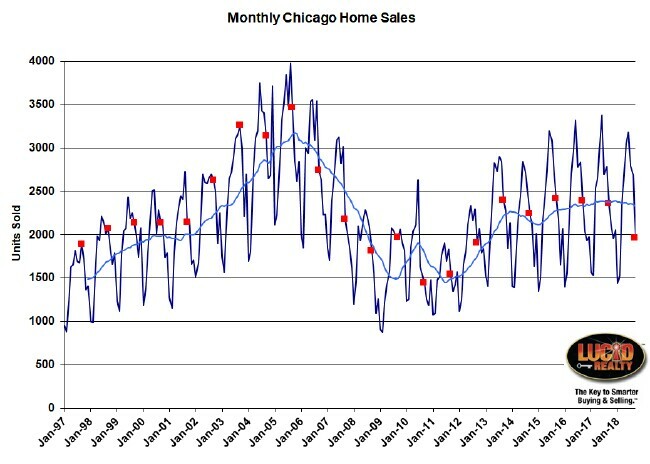 In addition, check out the graph of Chicago home sales below which goes back to 1997. It has all September values flagged in red and also has a light blue 12 month moving average that smooths out the monthly variations. Looking at that graph you can also see that last month had the lowest sales in the last 6 years. As I've been pointing out for a while now home purchase contract activity has been weak on and off throughout this year. You can see the overall impact in the light blue moving average in the graph below and September was another weak month - off 11% from last year, following a 13.5% decline in August. Those are significant declines and it makes September the weakest in 7 years. 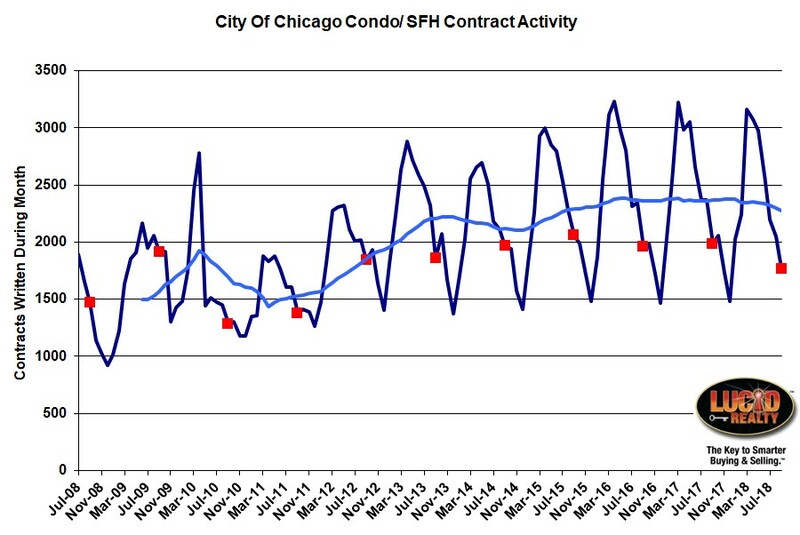 With contract activity that low it's no wonder closings were depressed so much and we should expect October to be another slow month. 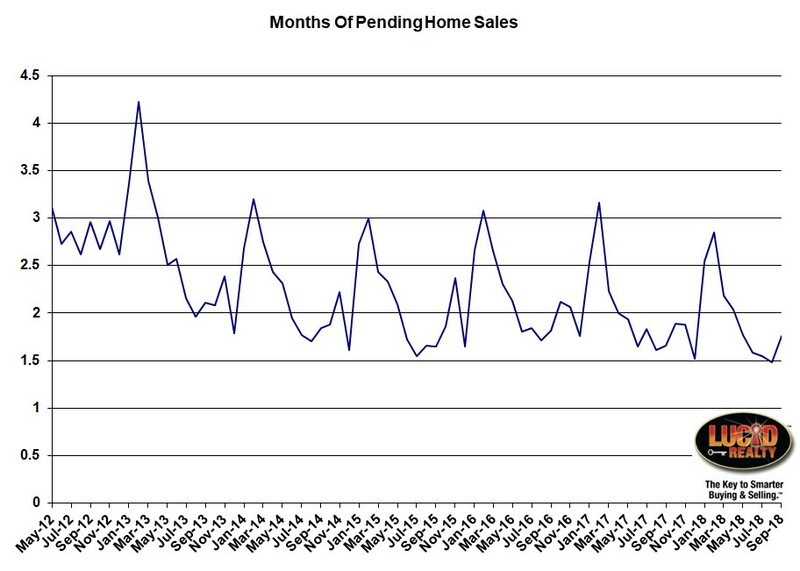 Pending home sales acts as a buffer between contract activity and closings. It's the backlog of homes that have gone under contract but have not yet closed. One of the problems we've been having for months now is that closings had been propped up by drawing down pending sales. Eventually that had to reverse and it happened in September with the months of supply rising from a 1.65 month supply last year to a 1.76 month supply this year. So this rebuilding actually contributed to the decline in home sales last month. 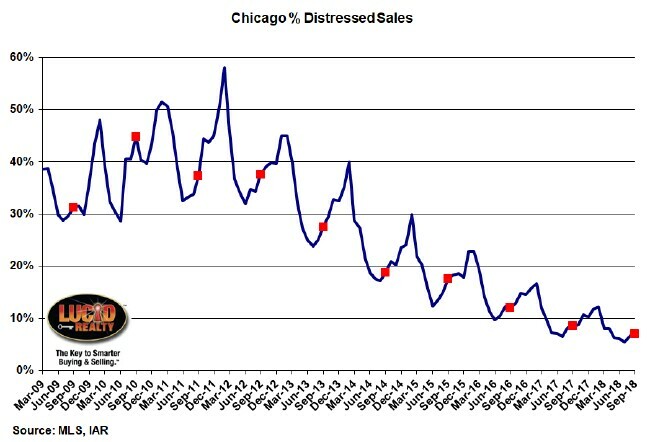 The percentage of home sales that are distressed continues to decline, hitting another 10 year low last month with 7.1% distressed sales vs. 8.6% last year. As you can see in the graph below we are reaching the lower limits of that number and consequently the declines are getting smaller and smaller. We've sure come a heck of a long way from the peak in 2010. A shortage of homes for sale is believed to be the key constraint on home sales. As you can see in the graph below we have record low inventories although there is some relief in sight for attached homes (condos and townhomes) which rose from a 3.8 month supply to a 4.2 month supply in September. On the other hand the inventory of single family homes declined from a 5.1 month supply to a 4.2 month supply. For the first time in many years both home types have the same inventory levels. With sales off so much there is a tendency for realtors and the media to refer to the market as having become slow. However, I think market time is a better indicator than sales levels of whether or not that is true because homes take a long time to sell in a "slow" market. And with inventory still tight it only makes sense that the time it takes to sell a home would still be short - and it is. The market time for single family homes declined slightly from 79 days to 78 days. However, consistent with rising inventory, the market time for attached homes rose from 56 days to 65 days - which is still pretty fast. Because homes are still selling so quickly I feel that the rumors of a slow market are greatly exaggerated. On our Web site we maintain this and other Chicago real estate market data.